One of the legacies that the ancient Native American Indians have created for themselves is the fact that they were extremely crafty and creative. There have been many famous American Indian craftsmen and pieces of art and one of the most popular of all of the arts and crafts are the intricate woven American Indian baskets. At first the Native Americans made basic baskets when they learned the art of basket weaving, these first baskets were out of the need for a means of carrying harvested nuts, berries and herbs. 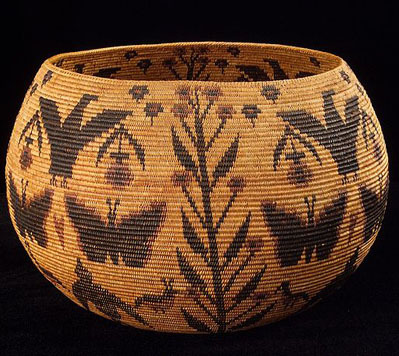 As the Native American women became more skilled at basket weaving is when they started working patterns into them and decorating the American Indian baskets with different paints, dyes, and beads. These baskets became much more intricate and gorgeous, and soon the American Indian baskets became an important source of income since they could sell them to travelers and also trade them for other goods at local general stores when settlers began creating towns. The infamous handmade American Indian baskets are extremely popular today and there are many mass produced Native American style baskets made that can be found in many large department stores. If you are looking for one of these authentic Native American baskets there are many places to find them, whether it is at a Native American reservation or one of the many authentic Native American stores that can be found online. There are thousands of people who also collect many of these authentic Native American arts and crafts, and many of these people also buy and sell on internet auction sites and at trade shows. Owning a true Native American craft is owning a true piece of Americana culture, and the Native Indians are all masters of their chosen trades. There are many American Indian families that devote their whole lives to learning a specific craft, and the trade is almost always passed on from one generation to the next. This is how the arts and crafts of American Indian culture have remained in existence for so long, and many families and tribes still make their livings off of their particular trades.